MIDDLE GRADERS: In “Waiting for the Magic,” by Patricia MacLachlan (Atheneum 2011), Will’s parents fight and his father leaves. This real–but sad–scenario is one that so many children (and parents) experience. 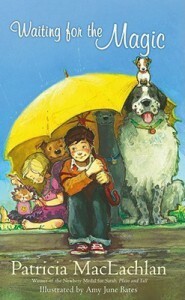 The next day, Will, ten, goes with Mama and his sister Elinor, four, to the animal shelter. They take home all four dogs and one cat. Papa didn’t want animals. Papa, who is a college literature professor, left to “find some magic” and write a book. Mama is preoccupied. She hasn’t hugged the kids since Papa left, but the four dogs and even the cat supply plenty of hugs and licks. The animals speak to each other, sharing their wisdom about what is going on in the house. Only Elinor, the youngest, and visiting Gran, the oldest, understand what the animals discuss. At first. It’s done matter-of-factly—that is, the animals are not overly cute, but simply intuitive and wise. The dogs–Grace (greyhound), Bitty (terrier), Neo (Great Pyrenees), and Bryn (the alpha mutt) eavesdrop and gather information to help the reader understand what is happening. We’re all surprised when Lula the cat speaks. There are other surprises, but I’ll only say it ends believably and happily and is perfect for reading to the whole family, perhaps right after dinner. “Saint Louis Armstrong Beach,” by Brenda Wood (Nancy Paulsen-Penguin 2011) is the title and the name of the sixth grade protagonist—a budding musician. He earns money playing his clarinet on the street in New Orleans. As Hurricane Katrina approaches, no one is much concerned. They’ve weathered hundreds of hurricanes. Saint Louis is detained in the city by his love of a dog named Shadow. Once you get to this point in the story, you won’t be able to put it down. So this one, I’d advise you read fast and on your own, perhaps, in bed and if necessary, under the covers with a flashlight. TEACHERS: What cool things are you doing in your classroom? Please let me know at phpowell@talesforallages.com New on blog will be interesting class events starting with the fifth grade class of Kathy Hughes, Speech Pathologist, at Franklin Middle and Carrie Busey Elementary in Champaign-Urbana, Illinois. Patricia Hruby Powell (www.talesforallages.com) is a nationally touring speaker, dancer, storyteller, librarian and children’s book author. Please sign up for the blog. Comment. Share it.